In 2006, the number of commuters taking the subway in New York City reached its highest point since 1952- however, in the same year the subway network actually decreased by 8 miles of service. By the year 2030, New York City is expected to be populated by nearly one million more residents, get 750,000 new jobs and receive millions more visitors. The average percentage of New Yorkers using public transportation in all 5 boroughs, is about 55%. However, as the data shows, currently, Richmond, Queens and Bronx counties are lagging behind in the percentage of total people who use public transportation. 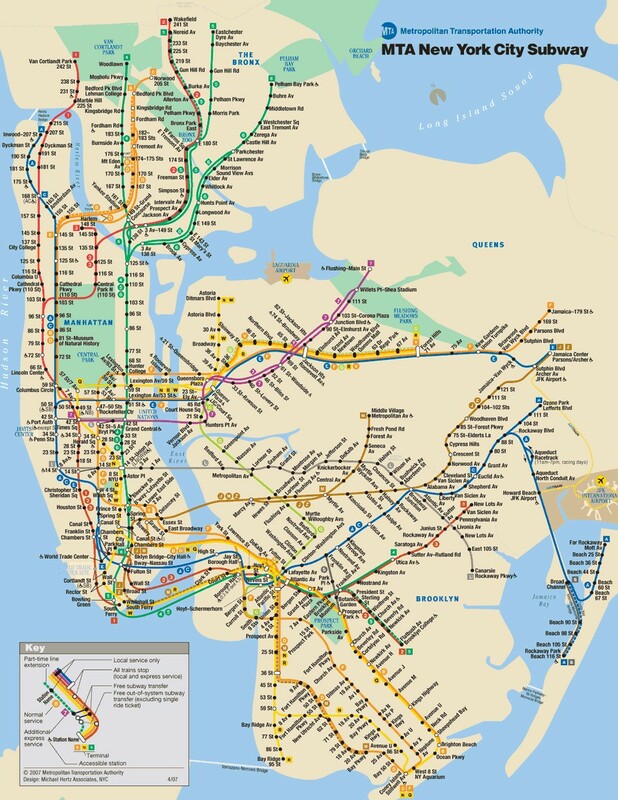 The current New York City Subway map clearly shows the lack tracks in a large part of Queens and Brooklyn, and even some parts of Bronx. A major problem that particularly affects Queen’s residents is not necessary the absence of access to lines, but the uneven ticket fares and prices. PlaNYC plans to improve service to areas of Queens and the Bronx- including an additional station at Sunnyside Yards (Long Island City) as a central base to make it easier for additional trains to serve stations in eastern Queens. The plan also hopes to extend service in Manhattan due to high demands and continue the 7 train to reach the Javits Center and pass through fast-growing areas. The 4 and the 5 lines are 110% and 108% capacity, the 2 and the 3 lines are at 106% and 101% capacity, the 6 is at 98% capacity, and the 1, A and C lines are operating between 84% and 87% capacity. Congestion Pricing is the idea of charging drivers a daily fee for entering the Central Business District during business hours (6am to 6pm on weekdays) to discourage driving, while promoting these drivers to take mass transit. Although the PlaNYC lays out an optimistic detailed plan of new subway lines and extended service, the costs of these initiatives are steep and the budget to ensure these changes is not guaranteed. The Bronx was the first borough to install a Bus Rapid Transit route in June 2008 and Brooklyn’s BRT service will be introduced between late 2008 and 2011. The BRT was previously funded through the Urban Partnership Agreement (UPA) between the City and the U.S. The DOT and the MTA are working together to implement Transit Signal Priority (TSP) in at least 223 locations, allowing buses to move faster by having to stop at fewer red signals. The DOT completed the redesign of three bus stops located under an elevated subway line. One location is at 20th Avenue and 86th Street in Brooklyn. The DOT implemented an improved interface between the subway station and the surrounding sidewalks at Bedford Avenue in Brooklyn. Congestion Pricing coupled with MTA changes and extensions to essential areas seems like the solution to increasing public transportation and decreasing depence of private transportation in the city. Puzzle Warehouse recycles everything it can to save the environment and to keep costs and prices low. Mikeabono saidA he started researching the city's best coffee shops using articles, blogs, Yelp, Google, and Zagat reviews, trying to avoid duplicates. New York City’s (NYC) intoxicating blend of energy, international dynamism, influence and street culture makes for one of the great world cities. New York has long been ahead of its time as a driver of international collaboration and globalization. Situated where the Hudson River meets the Atlantic Ocean, New York’s five boroughs collectively encompass some 520 miles of coastline. Foreign transplants and visitors from far away lands stand a better chance of enjoying some of the comforts of home in New York City than most any other place on the planet. An inspiring center of creative expression, New York City draws aspiring and established artists and their admirers to create and experience a rich array of cultural offerings. From Broadway stars to street buskers, performance arts hold a special place in New York’s cultural sole. Along with musicians of all genres, New York City’s pantheon of performance artists encompasses accomplished thespians, opera singers and dancers. Many art-house documentary, social issue and foreign films get their start in New York and Los Angeles before, hopefully, making their way to the rest of the country or world. For those looking to experience New York’s internationally renowned cultural institutions, the city’s impressive roster of world class venues includes: the Metropolitan Museum of Art, Lincoln Center, Carnegie Hall, the Metropolitan Opera, the Guggenheim Museum and Radio City Music Hall. New York University’s (NYU) Tisch School of the Arts and Columbia University’s Journalism School are highly regarded training grounds for the next generation of digital media makers and story tellers. New York City’s penchant for creativity, in all degrees of refinement, is reflected in the city’s thriving food culture. While New York has more than its fair share of exclusive, high-end eateries and globe-trotting celebrity chefs, the city’s food scene arguably owes as much to the vast, enterprising cadre of culinary entrepreneurs who ply their satisfying, mouth-watering wares on food carts and trucks throughout the city. Somewhere in between, emerging culinary innovators make news and attract devoted followings by introducing jaded New Yorkers to unexpected new tastes and flavors. Far from limited to the more and less rarified realms of art and food, creativity is also a defining characteristic of New York’s business world. Despite the breadth and variety of New York’s business community, there’s no escaping the importance of financial services to the livelihoods of the city and its residents. Considering these price points, it comes as no surprise that the vast majority of New York City residents, some 73 or so percent, are renters. A demanding, for many even frenetic, lifestyle of navigating super-charged urban stimuli, intense schedules and all manner of culinary temptations, all while calling home to exorbitantly over-priced, invariably cramped accommodations, makes it tempting to assume that New Yorkers are particularly prone to sudden, premature departures from the planet. Aggressive policing, new AIDS drugs and other improvements in medical treatments and health care all played important roles in disproportionately boosting life expectancy in New York. In other arenas, New York City has consistently been at the vanguard of taking measures aimed at improving health and well-being. Mayor Bloomberg’s administration extended NYC’s laudable efforts to prescribe healthier habits and set national standards by voting to ban trans-fats in public eating establishments and requiring disclosure of calorie counts. Motivated as much by environmental as health concerns, NYC has encouraged residents to cycle away calories they do consume by aggressively expanding urban bike routes. Never meant to be experienced from the confines of a cramped apartment, life in New York City always seems to offer up something interesting to see or do, many of which don’t even come with a cost of admission. In the 1970s, New York City's Metropolitan Transit Authority did a huge transportation overhaul. But one eagle-eyed Reddit user spotted an old map from the 1970s that shows what NY's subway system could have looked like, had the MTA gone with a different plan. There's also a K line, a U line that runs through Brooklyn all the way up to the Bronx, as well as a bizarre O line that seems to do a loop de loop at 14th street. Today, the transit system is plagued with two serious problems- it fails to provide access to too many New Yorkers, and lines in service face increasing congestion resulting in delays and unpleasant commuting experiences. Taking a closer look at the transportation systems and patterns of the three boroughs- the Bronx, Queens and Brooklyn will bring us closer to answer (Manhattan can be excluded firstly because of its lack of area compared to the other three counties, and the fact that it is the business center, while the other three are mainly residential; in addition, Staten Island can also be excluded because it is much more suburban than the other three counties and realistically, it is more kin to suburban areas of Long Island than the urban culture seen in Queens, Brooklyn and the Bronx). Many areas of Queens are not covered by the subway lines, but instead included as part of the LIRR. The plan also looks to extend Metro North service to new stations providing residents of Co-op City and Hunts Point with fast, direct rides to West Harlem. Also, a new 10th Avenue Subway Station will meet a strong, emerging need at West 41st Street. The problem with promoting mass transit occurs when the mass transit system is at, or nearing, its limit. This aims to reduce congestion, decrease greenhouse gas emissions and raise money for expanding the MTA lines to accommodate for all the new “converted” pubic commuters. Congestion pricing in particular aims to reduce congestion, decrease greenhouse gas emissions and raise money for expanding the MTA lines to accommodate for all the new pubic commuters. He also enlisted the help of his friends, and on the weekends tried to find out what type of equipment and beans were used at each shop to help determine quality. In New York, the potential for a thrilling, unexpected encounter always seems to be hiding in plain sight around every corner. A prized destination for those in search of opportunity, challenge, diversity and inspiration, NYC draws nearly one-third of its residents from somewhere else. In a fascinating New York Times Op-ed titled “My Endless New York” by acclaimed British historian Tony Judt, who came to New York University by way of Oxford, New York is, “a city more at home in the world than in its home country …. From the polished galleries of Tribeca and Soho to the street art of Union Square, New York’s art world caters to all manner of tastes and economic profiles. Many NYC subway goers appear to genuinely enjoy being serenaded by the sweet harmony of an old school, Motown-style doo wop group or the eclectic stylings of a traveling guitar player. Renowned NY dance institutions include: Alvin Ailey American Dance Theater, American Ballet Theatre, the New York City Ballet and the Joyce Theater in Chelsea. Cinemas like IFC Center in the West Village, Soho’s Angelika Film Center and the Landmark Sunshine Theater in the Bowery help give life to works that might otherwise go largely under-appreciated. Famous graduates of the prestigious Parsons The New School for Design nearby Union Square include Marc Jacobs and Norman Rockwell. Business moguls, philanthropists and other members of New York’s high society spend many an evening attending dinner engagements at the likes of Per Se, Le Bernardin, Daniel and Eleven Madison Park. A long-time leader in a host of creative industries, New York is home to many of the most influential corporations and personalities in old and new media, design, advertising and fashion. The average price for a Manhattan apartment was $1.4 million as of mid-2011, while the median stood at $800,000. The scale and complexity of NYC’s rental market supports a byzantine-like structure of apartment brokers, landlords and approval procedures that initially overwhelms most first-time renters. But a key source of New Yorkers’ longevity has been traced to a simpler explanation, walking. The city was one of the first to ban smoking in public places, including all bars and restaurants, as early as 2003. In 2006, the New York City Board of Health voted to adopt the country’s first major municipal ban on artificial trans-fats in restaurant cooking. From 2007 to 2011, the city has installed some 260 miles of bike lanes in the “densest, most contested parts of town,” according to New York City Transportation Commissioner Janette Sadik-Khan. A trip to the East Village, Washington Square Park in Greenwich Village, Union Square, Central Park or any number of other spots is almost sure to come with a healthy dose of entertainment and inspiration. Buses, subways, and stations were updated and modernized, bringing the city's subway system closer to what we have today. The M train starts and stops in Brooklyn and isn't affiliated with the B, D, or F, and there are more midtown cross trains, including the Q, X, and E.
The solution is clearly expansion, and the revenue for that expansion is expected to come from tolls collected from congestion pricing. Similar plans, though controversial, have already seen success in London and Stockholm, so it is a viable option for our city! Representatives from the 193 member countries of the United Nations General Assembly convene each September at the U.N.
As a European, I feel more myself in New York than in the European Union’s semi-detached British satellite [London], and I have Brazilian and Arab friends here who share the same sentiment.” No doubt aware of many of the locals’ foreign connections and international orientation, many NYC eating establishments don’t even bother to translate names or menu offerings from the native languages of their culinary origins. DOC NYC, held at IFC Center and New York University (NYU) in Greenwich Village, has quickly climbed near the top of the list of leading documentary film festivals in the U.S.
Brooklyn’s Pratt Institute is known for its high-ranking schools of interior, industrial and graphic design and architecture program. Not ones to welcome being outdone, even the titans of Wall Street seem compelled to express their creativity by engineering increasingly complex financial instruments. Even at these levels, buyers can take consolation in knowing that this works out to pricing per square foot well off the late 2008 peak of $1,400 for a condo or co-op. The mere act of assembling all the paperwork necessary to apply for an apartment often causes many people to lose out on their first attempt at landing a place. Not only do New Yorkers walk a lot, they have a habit of walking much faster than residents of anywhere else in the country, which has been linked to significant health benefits. Since July 2008, NYC restaurants and coffee chains have been required to display calorie counts on their menus. On the other hand, many residents would beg to differ that this impression is merely an unfortunate misconception of the natives’ inclination to be direct and relatively unreserved and visitors not enjoying enough quality interaction time to appreciate the endearing upside of New Yorkers’ unabashed frankness. Although the $7.60 ride takes almost half the time, most commuters do not choose to take the LIRR lines due to the price tag. At that rate, a cool $1.4 million would be good for 1,000 square feet, while $800K would work out to a rather more modest 571 square feet, still relatively decent-sized for a one-bedroom apartment in Manhattan. In 2008, the operations of MTA Bus Company and NYC Transit were merged into a new regional operation, MTA Regional Bus Operations. This suggests that economic factors do influence commuter choices, but also suggests that despite median income values, commuters tend to select the cheapest alternative- over saving commuting time. The New York City Transit Authority (NYCTA, and branded as MTA New York City Transit) is a public authority in the U.S.
21.11.2015 at 11:44:41 Available, but due to the exclusive colour scheme that a coffee. 21.11.2015 at 19:36:29 The eBay Partner Network through can operate all brands of huge scale trains.